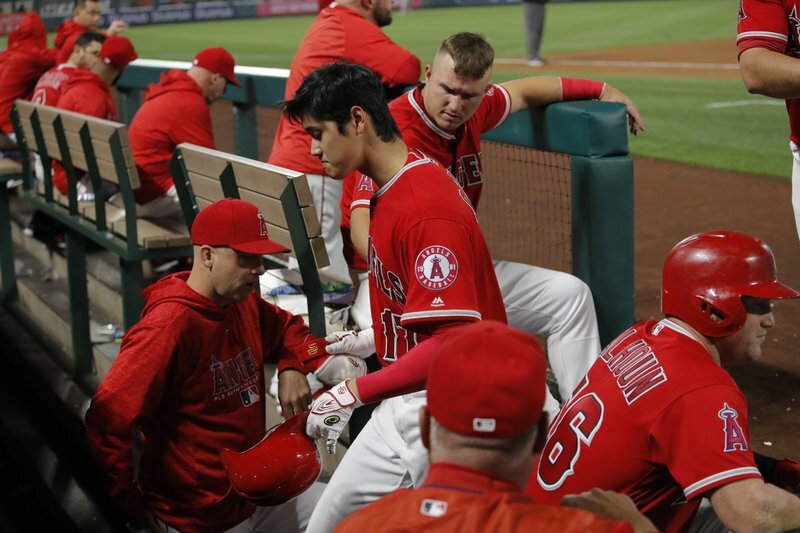 The Angels are hoping for good news on two-way sensation Shohei Ohtani after he left Friday’s game against the Yankees with a mild left ankle sprain. The initial ruling was that Ohtani would be day to day. The Japanese star hit his fourth home run in the second inning, then left after trying to beat out a ground ball in the fifth. White Sox slugger Matt Davidson has already set a record for home runs in a season by a visiting player to Kauffman Stadium, socking homers No. 6 and 7 on Friday night. In four games against the Royals this season, Davidson is 8 for 15 with seven homers, including a trio on opening day. The Royals will try to slow Davidson during a doubleheader with Trevor Oaks in the pitcher’s major league debut. Joey Votto has homered in four straight games since shaking a sluggish start to the season. Votto batted .247 with just one extra-base hit in his first 21 games before starting this homer streak. He reached base six times in a 15-9 win over Minnesota on Friday night, and the Reds will try to hand Minnesota a ninth consecutive loss with Sal Romano facing Jake Odorizzi. Cubs manager Joe Maddon hopes slugger Kris Bryant will return to Chicago’s lineup against Milwaukee. Bryant was beaned during a victory at Colorado last weekend and missed his fourth straight game on Friday. “I’m not going to jump the gun, but talking to everybody, I want to give him a chance to come back,” Cubs manager Joe Maddon said. The Dodgers will give pitching prospect Walker Buehler his second major league start in a game against San Francisco. Buehler pitched five scoreless innings against Miami in his first start Monday. The right-hander has 147 strikeouts in 106 2/3 career minor league innings.